It walks like a tablet, but talks like a laptop — the super slick Surface Pro is Microsoft’s answer to the latest iPad, and probably the one after that too. 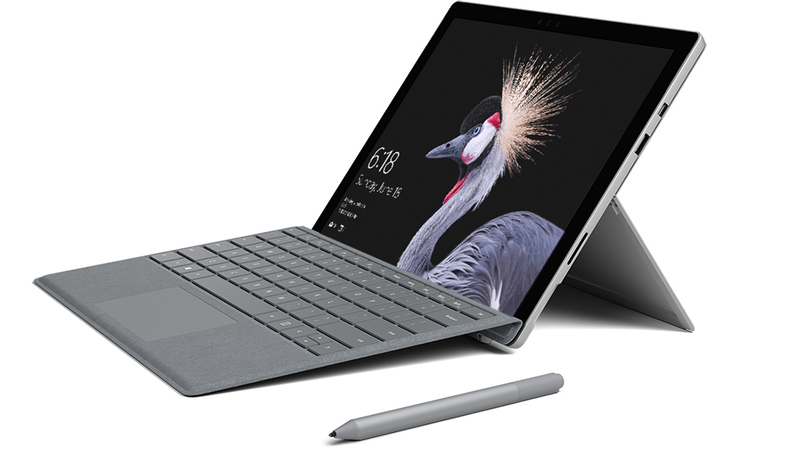 A 12.3” laptop/tablet hybrid, made of a magnesium-aluminium alloy with a matte finish, the Surface Pro has a 2,736 x 1,824-resolution touchscreen with a premium look and feel that outstrips Apple’s Retina display. It also has a huge kickstand with a hinge that affords more adjustability than you’ll need in addition to a USB 3.0 port (plus an extra one on the power brick), Mini DisplayPort, microSD reader, 5 MP front-facing camera and an 8 MP rear-facing autofocus camera. The version loaned to Scottish Legal News for testing, the Surface Pro LTE, weighs in at 812 grams, compared to 692 grams for the heaviest iPad Pro. The battery lasted for a good seven hours of internet browsing and document-based work. All of the models in the Surface family can easily handle routine office work and entertainment, while the beefier Intel Core i5 and i7 versions are also capable of more intensive photo and video editing. The device also has facial recognition so you can sign in using the camera instead of a password if you’re so inclined. Given that its operating system is Windows 10 Pro you can run any software you like and won’t be hunting around for ill-fitting advert-laden mobile analogues to your preferred desktop programs. And the familiar Windows environment means continuing office work on the Surface is hassle-free. The wireless keyboard attachment is a pleasure to use. The keys have a satisfying and surprising degree of travel and the keyboard itself is sturdy. Unlike some laptops, the trackpad’s surface isn’t entirely depressable, but it gets the job done. The keyboard attachment also doubles up as a cover which clicks magnetically – and solidly – into the tablet/screen. The mouse is incredibly cool and looks like something out of a sci-fi film: it snaps into a curve for use and then snaps back flat for storage. A strip in the middle simulates a flywheel, with a mechanical sound and haptic feedback to boot. Because the keyboard doubles as a cover and the mouse folds, the whole system is a mere slip of a thing, making it easy to pop into a small bag for your commute. The charger is also fortunately much smaller than a typical laptop brick. The Surface Pen, also sold separately, can be used to mark-up documents as you would on paper, which you may prefer over adding comments with a keyboard in Word. It also has an ‘eraser’ on the top to rub things out, just like a pencil. Because it can be used for illustration and design it’s more technically sophisticated than a normal stylus, but at a cool £99.99 it may well be overkill for simple annotation. Earlier this year Morton Fraser introduced an agile working policy to formally recognise the flexibility its staff already enjoyed, something other firms are no doubt also doing. In this context, a device like the Surface really comes into its own, especially if you’re working on the move. The model with mobile connectivity (LTE) will save you relying on Wi-Fi when travelling, and let’s face it — you have little choice if you’re relying on ScotRail, where a seat is often a luxury. The form factor is even more useful if you’re flying and space is at a premium; I took the device abroad and the small footprint of the machine was a huge boon. A laptop would’ve been too big to carry in hand luggage and also would’ve attracted extra costs from the usual (budget airline) suspects. If you like to travel light this is something to seriously factor into the price tag, for which – brace yourself. The Surface Pro LTE is aimed at business users and retails for £1,399. And that’s without the keyboard-cover, mouse or Surface Pen. If you treat the purchase as a laptop it’s more palatable but hopefully Microsoft bundles future editions with the keyboard at least. If you were thinking of getting an iPad Pro or other tablet to complement your laptop, I’d spend the extra couple of hundred quid and get the Surface, which can replace both. Better yet, get your law firm to buy one.